Varun Tej is an Indian film actor known for his works in Telugu Cinema. He made his debut as a lead in the film Mukunda, directed by Srikanth Addala opposite Pooja Hegde. His second film Kanche, also being the first Indian film on WWII, became a super hit and Varun Tej's portrayal of Dhupati Haribabu was critically acclaimed. Varun Tej played the role of protagonist in space thriller film Antariksham 9000 KMPH. Varun Tej is the son of actor Nagendra Babu. His paternal uncles Chiranjeevi, Pawan Kalyan and his cousins Ram Charan, Allu Sirish and Sai Dharam Tej are also actors in Tollywood. He did his primary schooling form Bharatiya Vidya Bhavan, Jubilee Hills. Varun Tej debuted as a child artist in his father Nagendra Babu's film Hands Up! when he was just ten years old. He made his adult debut with Mukunda, starring opposite fellow newcomer Pooja Hegde. The film earned mixed reviews. His second venture was the 2015 war film Kanche, starring opposite fellow Pragya Jaiswal and received positive reviews from critics. 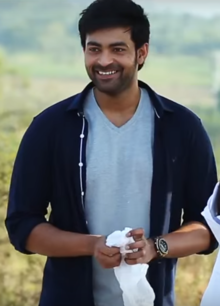 Varun Tej's performance as Dhupati Haribabu was praised with The Times of India praising his "capability to shift gears from intense to sobriety". His second release that year Loafer, was a box office failure, along with his 2017 outing Mister. The later half of 2017 saw the release of Fidaa, where he played an NRI falling in love with a village belle. The film earned critical acclaim for its simplicity, performances by the principal cast and his portrayal as an NRI guy earned him praise as well, with 123telugu.com calling his "ease with emotions in the film quite heartwarming".His chemistry with costar Sai Pallavi was widely appreciated and it was one of the highest grossing Telugu movies of 2017. His recent release Tholi Prema (2018 film) is super hit and a box office success and Varun Tej's performance as impulsive young man is widely appreciated. His next film is a space thriller titled Antariksham 9000 KMPH, directed by Sankalp Reddy of Ghazi fame and Aditi Rao Hydari and Lavanya Tripathi as female leads. The film is going to release on December 21, 2018. He is also currently shooting for a film titled F2 - Fun, and Frustration which is a multistarrer with Venkatesh Daggubati. Tamannaah and Mehreen Pirzada are also a part of this movie. ^ "Antariksham 9000 KMPH Teaser: A promising & thrilling space-adventure on the cards". ^ "Kanche Movie Review, Trailer, & Show timings at Times of India". 24 October 2015. Retrieved 26 August 2017. ^ "Fidaa Telugu Movie Review | Varun Tej Fidaa Telugu Movie Review | Fidaa Cinema Review | Fidaa Review and Rating | Fidaa Telugu Review and Rating | Fidaa Telugu Cinema Review | 123telugu.com". www.123telugu.com. Retrieved 26 August 2017. ^ "Varun Tej's space-thriller Antariksham 9000 KMPH wraps up its shoot". ^ "Tamannaah Bhatia, Mehreen Pirzada to share screen for F2: Fun and Frustration". ^ "Antariksham movie first look". Times of India. ^ "F2 duo Venky & Varun dub for Hollywood biggie Aladdin".